a Red Pumpkin Studio: T-shirt designs: Zeppelin rides. I spent the last couple of days working on this t-shirt for no particular reason other than to try it out. For the non-geeks out there it's based on the sci-fi trope that parallel universes always seem to have zeppelins. 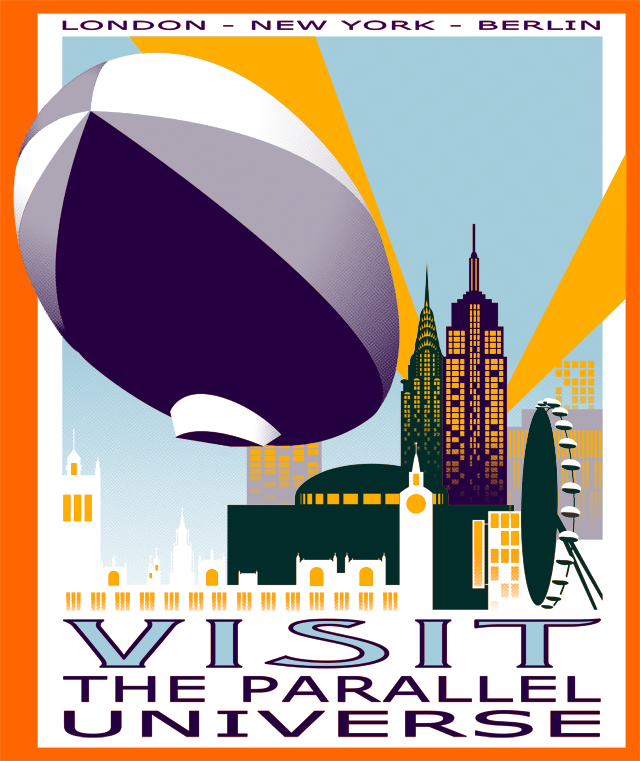 This was a fun project because I got to pull out my Retro Graphics book and mimic art deco travel posters, which I love. It was also a way for me to experiment with vectors in Photoshop, which I'm finally getting a hang of. I also enjoyed having to limit my colour palette to six colours (for printing), which made me get creative with the design, and learn to do halftones for the gradients. I think this would be kind of cool on an orange shirt, which is why it's pictured on that background, but there are probably a lot of colours that would work well. Now to find a good place to publish this! i`ve discovered your blog not that long ago...i`ll keep visiting.